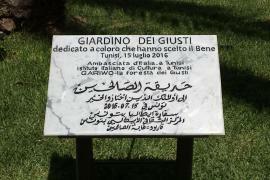 On 15 July 2016, the Garden of the Righteous in Tunis was inaugurated, within the Italian Ambassy in Tunis. President of Gariwo, Gabriele Nissim, Ambassador Raimondo De Cardona and the President of the Tunisian League for human rights Abdessatar Ben Moussa, have honoured five Righteous of the prensent and the past, who risked heir lives, in order to struggle against persecutions, terrorism and for the defence of human rights. The righteous honoured were Hamadi Abdesslem, the Tunisian guide who saved the Italian tourists during the ISIS attack at the Bardo; Mohamed Bouazizi, the young seller who sacrified himself and gave birth to the Arab Spring; Khaled Abdul Wahab, the Tunisian entrepreneur who in Mahdia saved the Jews who were victims of the nazi persecution; Khaled al-Asaad, the archaeologist who was massacred by ISIS since he had defended the cultural heritage of Palmira in Siria, and Faraaz Hussein, the young Bengali student who gave up saving himself in order not to leave his friends during the Dhaka slaughter.